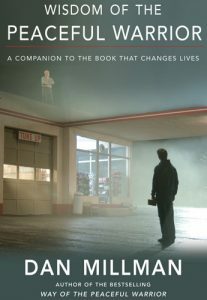 Which of your book(s) would you most recommend? Which one should I start with? Should I read them in a particular reading order? Each of my books provides a new and different facet of a peaceful warrior’s approach to living wisely and well. In a sense, each book is another piece of the puzzle of personal and spiritual growth. I put my heart and soul into each one. I hope this background may help you to decide which of my books to read. The order is not important — but I hope you will consider reading most or all of them, over time. Do not assume that if you’ve read one or two you have read them all. There is always more to be discovered around the next bend in my teaching work. Look over the descriptions below, and trust your instincts. 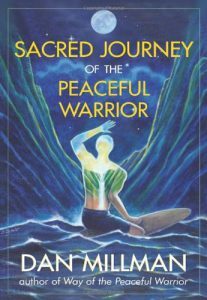 SACRED JOURNEY OF THE PEACEFUL WARRIOR – my other novel – is not a sequel – it does not begin where my first book ends (and this has confused some people). Rather, it takes place within the first story (when Socrates sends me away on my travels). 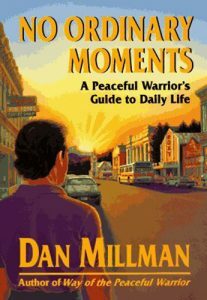 In fact, one good way to read these two books is to read Way of the Peaceful Warrior until Soc sends Dan away to travel around the world – then read Sacred Journey – and then finish Way of the Peaceful Warrior. This way it makes more sense. 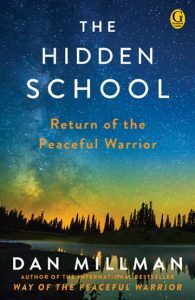 Return of the Peaceful Warrior – The Hidden School reveals a book within a book, a quest within a quest, and a bridge between worlds. 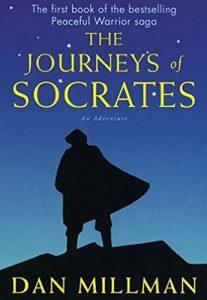 THE JOURNEYS OF SOCRATES – I devoted four years of my life to writing Socrates’ story, to finally answer the many questions I’ve received over the years about where he came from, whether he was married or had children, how he became a warrior, and how he found wisdom and peace. I set out to meet the challenge of writing a novel with depth and character and heart. Most readers who enjoy an adventure saga interweaving life’s important themes find this book one of my best. NO ORDINARY MOMENTS was written in response to those initial requests. It summarizes, as fully and clearly as possible, all I had learned to that point in my life. It remains one of my most comprehensive works. 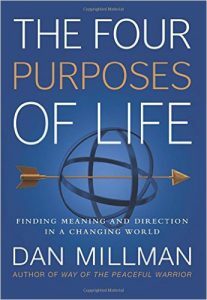 THE FOUR PURPOSES OF LIFE : Finding Meaning and Direction in a Changing World – One of my most compact books (about the size of The Laws of Spirit) yet one of the most comprehensive books I’ve yet written. For the first time, more than three decades since I began writing, this “little book of big ideas” puts together all the puzzle pieces, placing some earlier teachings (in distilled form) into their complete context, along with considerable original material about finding our career and calling. Especially useful for anyone going through changes and wondering, What next? A quantum leap in awareness of oneself and one’s life purpose -— all four of them. 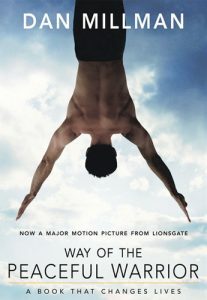 WISDOM OF THE PEACEFUL WARRIOR – In 2006, when the “Peaceful Warrior” movie with Nick Nolte was originally released, it seemed that the time had come – and in fact the need was pressing – to clarify the teachings in my best-known book, from a perspective and state of awareness 25 years after the first book was written. I consider this book an essential companion to Way of the Peaceful Warrior, and, in fact, don’t believe someone can truly understand some of Socrates’ core teachings until they read this book. THE LIFE YOU WERE BORN TO LIVE : In 1984 I learned, from an unusual mentor, an amazingly accurate, piercing method of insight into one’s life purpose that surpassed any I had ever seen. I had only taken 20 pages of notes before working with this system, doing “spiritual law alignment” readings for people all over the world. After a decade of working with this material, my intuitive sight had expanded considerably. 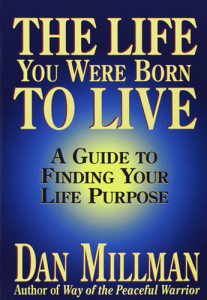 I started teaching psychotherapists and others the method; and finally, I wrote The Life You Were Born to Live. For those readers who “aren’t into numerology” or who have healthy skepticism about how adding up the numbers of your date of birth could give valid, reliable, accurate information about your life purpose, I challenge you to read page 4, which shows how to find your life path – one of 37 for those born in the 1900’s – then read the material specific to your life. You may find it surprising. I wrote The Life You Were Born to Live to generate greater more compassion for yourself and for others – and to create a quantum leap in insight and self-knowledge. The most important part of this book is the section on spiritual laws – the laws that help to overcome the hurdles on each life path. 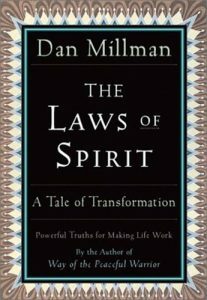 THE LAWS OF SPIRIT: This “Tale of Transformation” presents a parable about an ageless woman sage I meet in the mountains near my home. There, using the forces of nature, she teaches me twelve laws that change lives. Readers learn each law with me as we journey through the mountains. This little book is not as well known as some of my others, but readers often select it as one their favorites. 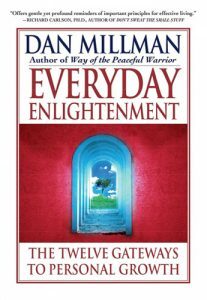 EVERYDAY ENLIGHTENMENT : The Twelve Gateways to Personal Growth. 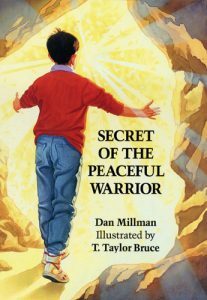 This book provides the most comprehensive statement of the “peaceful warrior’s way,” organized around 12 universal challenges of everyday life. In a sense, it is a map of our human journey through life. If life is a school, it highlights the 12 courses we need to pass in order to graduate. It redefines the meaning of success, enlightenment, and spirituality. I believe it is destined to become a classic in the field of personal and spiritual growth. 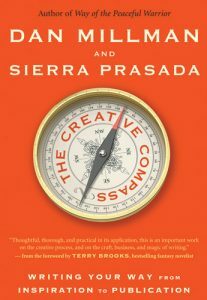 THE CREATIVE COMPASS: Writing Your Way from Inspiration to Publication – by father and daughter coauthors Dan Millman and Sierra Prasada. If you’re a writer, storyteller, artist, or innovator, the five universal stages of creativity presented in this book will help you to: pursue ideas with which you strongly connect; observe what works for you and commit to it; work through inevitable doubt and anxiety; appreciate drafts as essential layers leading to quality work and mastery of craft; and recognize, in the practice, a metaphor that will enrich your life. 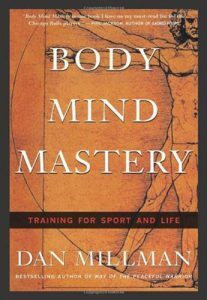 BODY MIND MASTERY : Creating Success in Sport and Life – Lauded by young athletes as well as world-class professionals, musicians, martial artists, opera singers, horse and dog trainers, dancers, actors, and anyone who is engaged in mind-body training, this unusual book has been published under several earlier titles, including “The Warrior Athlete” then “The Inner Athlete.” Each new edition was further edited and refined. Unique in its balanced approach to training, with practical techniques as well as big-picture perspectives that bring more meaning, this book reminds us not to dedicate our lives to our training, but rather, to dedicate our training to our lives. 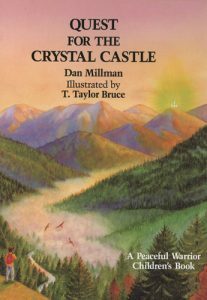 Then came my two children’s books: SECRET OF THE PEACEFUL WARRIOR and QUEST FOR THE CRYSTAL CASTLE. I read early drafts of these books to my (then-young) daughters’ classes for their feedback before the final draft. These make wonderful children’s gifts for kids 4-10 or so; they will want to hear (or read) them again and again.